Veracity CCM offers a modern and proactive approach to managing our clients’ corrosion and chemical management requirements. The user-friendly interface provides a common analysis platform resulting in data driven decision making. Industry failure data tells us that corrosion is responsible for repeated and widespread mechanical integrity failures many of which are avoidable and result in significant direct and indirect consequences for operators. Industry has historically understood integrity management as an inspection biased process. Inspection does, however, have many limitations and is ultimately somewhat reactive, as it seeks to identify degradation once it has already occurred. Operators often seek to mitigate corrosion and improve flow assurance by effective chemical treatment programs. Although recommended, these are often set up and managed by third-party chemical suppliers, creating a conflict of interest. 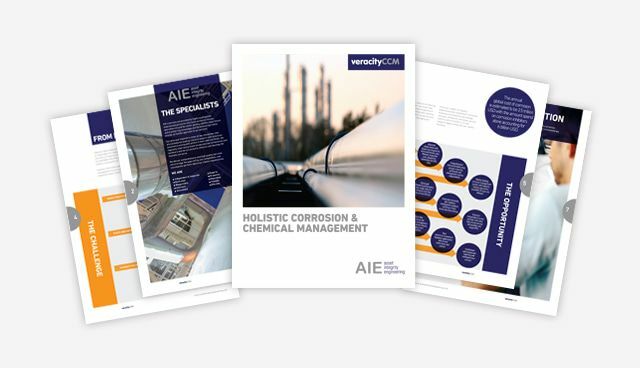 AIE considers the majority of existing integrity, inspection, corrosion and chemical management programs to be inefficient, expensive and reactive. We promote a modern, proactive and holistic strategy for managing our clients’ assets. 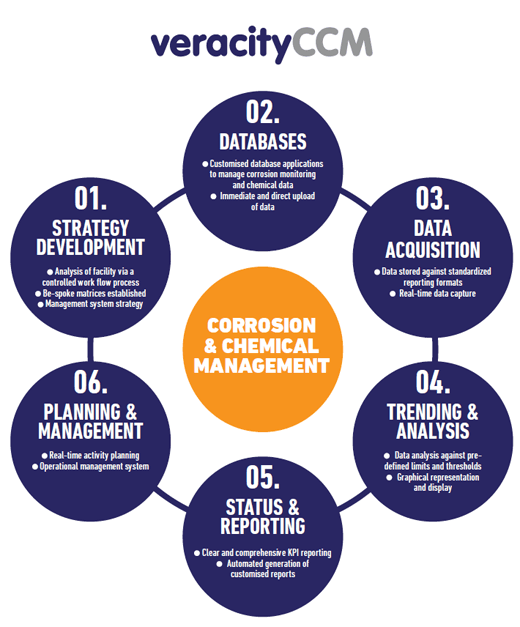 Veracity CCM includes customised databases for all corrosion and chemical monitoring requirements. Users are given pre-determined access rights to enable secure global data access on demand. Data can be linked to multiple documents which are then securely stored against visual KPI summary boards, allowing users to easily target areas of concern and efficiently access key information. Veracity CCM ensures operators setup corrosion and chemical management systems via a controlled and engineered work-flow process. The software follows a segmentation philosophy whereby a facility is divided into systems according to the different process and environmental conditions. The matrix setup tool then assigns monitoring and mitigation techniques with appropriate thresholds to selected threat categories. Matrix setup is pre-populated but can also be customized to suit any industry or operating requirement. Veracity CCM is configured for immediate data upload to conserve operator resources. The software provides a user-friendly platform for cross-disciplinary representatives to evaluate data against pre-defined thresholds. Veracity CCM is flexible and allows graphical representation of data enabling users to compare trends and make efficient data-driven decisions. Veracity CCM includes a planning module which links activities to assigned action owners. The software also communicates overdue tasks and directs reminder notifications to users when actions are not completed in time. An action tracking system is also included for non-routine activities. If the operators choose to alternatively use their existing centralised maintenance management system to drive the integrity management program, then the software can be customised to integrate with the asset specific CMMS. The software includes multiple reporting options which can be further tailored to meet client requirements. Reports can be generated at different levels according to the intended audience. From high level management summary reports to detailed status updates which include long-term trends and in-depth analysis for each KPI. Veracity CCM offers an immediate reporting solution aimed to minimise resources and deliver quality.